Shark Week - Super Macho Shark Knife! For this year's Shark Week, take a look at this impractical super macho Shark Knife that will terrify your enemies! The Oracle Jimmy's Prediction - Jimmy El Cuy Peruano (Peruvian Guinea Pig) Makes His World Cup Predictions! Screen shot of Jimmy the Oracle Peruvian guinea pig. World Cup, South Africa 2010 - Spain vs Germany (1-0) Carlos Puyol's Goal! Today's Germany vs. Spain match will be defined by some key individual matchups: Schweinsteiger vs. Xavi and Lahm vs. Villa to name a couple. Goal.com goes in depth to take a look at four key individual encounters that will go a long way towards determining who will face The Netherlands on Sunday. M & C Sport's wrote ~ "Spain's Carles Puyol (R) heads the ball in for a goal during the FIFA World Cup 2010 semi final match between Germany and Spain at the Durban stadium in Durban, South Africa, 07 July 2010. EPA/HALDEN KROG"
World Cup, South Africa 2010 - David Beckham's Game Face & Obama's Laugh! This image of President Obama, which is going viral on the net and Twitter, is becoming a big hit with football (soccer) and sports fans arond the world in the last 24 hours. It shows the reaction of both England's former captain David Beckham and President Barack Obama after England's keeper Rob Green made that horrible blunder against the U.S. in Saturdays, June 12, 2010 first round match in South Africa 2010. What are your thoughts of Obama smiling in this picture? USA World Cup Final Roster Announce On ESPN! Via U.S. Soccer - "U.S. Head Coach Bob Bradley Names 23 Players to Represent the United States at the 2010 FIFA World Cup in South Africa. U.S. Men’s National Team head coach Bob Bradley has named the 23-man roster that will travel to South Africa for the 2010 FIFA World Cup. The team departs for South Africa on May 30, and will play their opening match of the tournament against England on June 12 in Rustenburg live on ABC at 2 p.m. ET. CHICAGO (May 26, 2010) — U.S. Men’s National Team head coach Bob Bradley has named the 23-man roster that will travel to South Africa for the 2010 FIFA World Cup. The team departs for South Africa on May 30, and will play its opening match of the tournament against England on June 12 in Rustenburg live on ABC at 2 p.m. ET." More info on U.S. Soccer. FIFA World Cup 2010 - Trailer! Gasquet289 wrote ~ "World Cup 2010 trailer. This compilation that i made for the www.soccerfanbase.com CC1 is the probably last compilation before my full compilation for the SCCC5. I would like your opinions, and rate, comment this. Watch in High Defenicion Alta! 720p True HD!" FIFA's Football World Cup, South Africa 2010; the first World Cup in the African continent will be the biggest televised event in world history . 30 Days Left - FIFA World Cup - South Africa 2010 Wallpaper! With 30 days left, here is the main wallpaper for the 19th FIFA Football World Cup - South Africa 2010 from Video Games Blogger. The tournament starts on June 11 and ends on July 11, 2010. The opening match is between the host country South Africa vs Mexico. The World Cup is bigger than the Summer & Winter Olympics combined. NFL Superbowl, MLB World Series, NBA Finals, etc.....HA! They are all minor leagues compare to football's World Cup. The World Cup is the biggest mass media event on planet Earth, and it gets bigger & bigger every four years. South Africa 2010 will be by far the biggest sports betting event in human history. 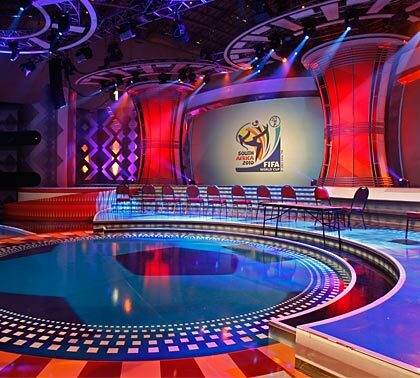 Live Coverage - FIFA World Cup South Africa 2010 Draw! Check out the World Cup Final Draw Coverage to see which teams are placed into which groups. Final draw coverage begins Friday, December 4, 2009 at 12 p.m. EST. Ms Theron, whose long-term partner is Irish actor Stuart Townsend, pulled out the 'Ireland' ball instead of a 'France' ball. But, unlike much of the rest of the world, Ms Theron was not laughing at us. Instead, she was having a laugh at FIFA's expense after Ireland's failed bid to become the 33rd team at the event. "Yes, she did, but it was only a joke," FIFA general secretary Jerome Valcke said. As the tournament gets closer, the odds will change a bit. Rumors have it that the "Smart Money" will increase their wagers into the English side and their odds will change to 5/1. As always, since the beginning of the World Cup 80 years ago at Uruguay 1930, the top four favorites to win the tournament have come from South America and Europe only. In fact, South America has 9 World Cup wins and Europe has also 9 wins. South America is the only region in the world to win the World Cup outside their own continent, Brazil in 1958 and 2002! FIFA World Cup South Africa 2010 logo.